"Our victory is the cross of Jesus, victory before our enemy, the great ancient serpent, the Great Accuser". In the cross "we were saved, in that path that Jesus chose to sink to the very lowest point, but with the power of divinity ". 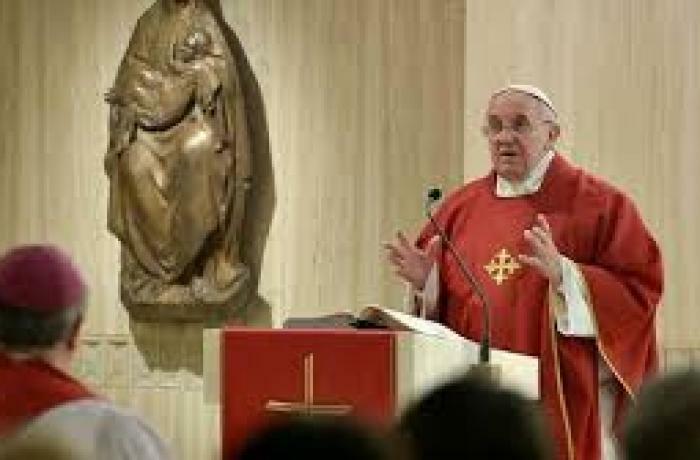 Vatican City (AsiaNews) - The cross of Jesus "is our sign of defeat, which causes persecution, which destroys us, it is also our sign of victory because God has won there" and chained Satan said Pope Francis today at Mass at Casa Santa Marta, on the feast of the Exaltation of the Holy Cross. The Pope explained that when we contemplate the cross, the mark of Christians, we contemplate a sign of defeat but also a sign of victory: “All that Jesus did during his life” failed on the cross - he said - and all the hope of his followers came to an end. “We must not be afraid to contemplate the cross as a moment of defeat, of failure. When Paul reflects on the mystery of Jesus Christ, he says some powerful things. He tells us that Jesus emptied himself, annihilated himself, was made sin to the end and took all our sins upon himself, all the sins of the world: he was a ‘rag’, a condemned man. Paul was not afraid to show this defeat and even this can enlighten our moments of darkness, our moments of defeat. But the cross is also a sign of victory for us Christians”. The Pope recalled that in the first Reading, the Book of Numbers tells of the moment during the Exodus when the people who complained “were punished by serpents”. This, he said, refers to the ancient serpent, Satan, the “Great Accuser”. But, the Pope continued, the Lord told Moses that the serpent that brought death would be raised and would bring salvation. Francis explained that this “is a prophecy”. In fact, he said, “having been made sin, Jesus defeated the author of sin, he defeated the serpent”. And Satan, the Pope commented, was so happy on Good Friday “that he did not notice” the great trap “of history in which he was to fall. As the Fathers of the Church say, Pope Francis continued, Satan saw Jesus in such a bad state, and like a hungry fish that goes after the bait attached to the hook, he swallowed Him. “But in that moment, the Pope said, he also swallowed His divinity because that was the bait attached to the hook. “At that moment, the Pope said, Satan was destroyed forever. He has no strength. In that moment the cross became a sign of victory”. 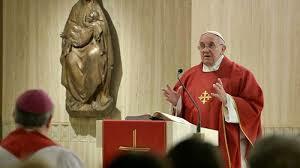 “Our victory is the cross of Jesus, victory over our enemy, the ancient serpent, the Great Accuser” the Pope said. “We have been saved” by the cross, by the fact that Jesus chose to sink to the very lowest point, but with the power of divinity”. “Jesus said to Nicodemus: When I am lifted up I will draw all people to myself”. Jesus was lifted up and Satan was destroyed. We must be attracted to the cross of Jesus: we must look at it because it gives us the strength to go forward. And the ancient serpent that was destroyed still barks, still threatens but, as the Fathers of the Church say, he is a chained dog: do not approach him and he will not bite you; but if you try to caress him because you attracted to him as if he were a puppy, prepare yourself, he will destroy you”. Our life goes on, Pope Francis concluded, with Christ victorious and risen, and who sends us the Holy Spirit; but also with that chained dog, the devil, “whom I must not draw close to because he will bite me”.